Würzburg, 29 March 2019. va-Q-tec AG (ISIN DE0006636681 / WKN 663668), pioneer in highly efficient products and solutions in the area of thermal insulation and TempChain logistics, today publishes its annual report for the 2018 financial year. On the basis of final, audited figures, the company confirms that its adjusted forecast for 2018, already communicated with the preliminary figures, has been achieved and that progress has been made in the Services business. A key milestone was also reached in 2018 with the completion of most of the growth investments and initiatives announced at the time of the IPO. Together with the “Power 20+” performance program, the Management Board consequently believes that va-Q-tec is well prepared to achieve stronger and more profitable corporate growth in 2019 than in the previous year. Revenue was up by 8% to EUR 50.7 million in 2018 (previous year EUR 46.9 million), with the company thereby having grown by a total of 125% over the past three years from EUR 22.5 million in 2015. With further strength from the Products business (EUR 20.1 million; +12% year-on-year) and a slightly positive Systems business (EUR 11.3 million; +5% year-on-year), the high-margin Services business also recorded moderate growth (EUR 18.4 million; +6% year-on-year), but failed to match original expectations. In the second half of the year, and especially in Q4, the Services business showed a significant upswing with a broader customer base (see “Quarterly revenue trends” below). Earnings before interest, tax, depreciation and amortisation (EBITDA) reported a marked reduction (EUR 3.0 million; -58% year-on-year). The EBITDA margin measured in terms of total income consequently stood at 5% in the reporting period (previous year: 13%). In addition to the high share of revenue accounted for by the lower-margin Products business, EBITDA was also negatively impacted by advance investments in additional personnel and internationalisation as well as one-time relocation and double costs incurred in connection with the expansion of locations. The completion of a large part of the growth investments in 2018 laid the foundation for further business expansion. As a high-tech manufacturing company, va-Q-tec has invested around EUR 70 million in its business expansion and internationalisation since its IPO. For example, its five Würzburg locations were merged to form a new technology and logistics centre, with va-Q-tec thereby enhancing operational efficiency and significantly expanding production and logistics capacities. In addition, va-Q-tec invested in additional marketing, IT and sales resources. In line with its growth strategy, va-Q-tec successfully advanced the internationalisation of its business activities, including in North America. With the new Fulfilment Centre in Langhorne, Pennsylvania, the production and distribution of small thermoboxes can now be realised locally. Together with the two subsidiaries in Uruguay and Singapore that were newly formed in 2018, the Group now consists of eight companies. In the fourth quarter of 2018, the management launched the “Power 20+” program in order to focus on profitable revenue growth and continuous cost efficiency. “2018 was a challenging but also very instructive year, when we laid the foundation for our successful corporate development and growth in the future with our largely completed growth investments for the next level, the significant expansion of our resources, our further internationalisation and the Power 20+ program. 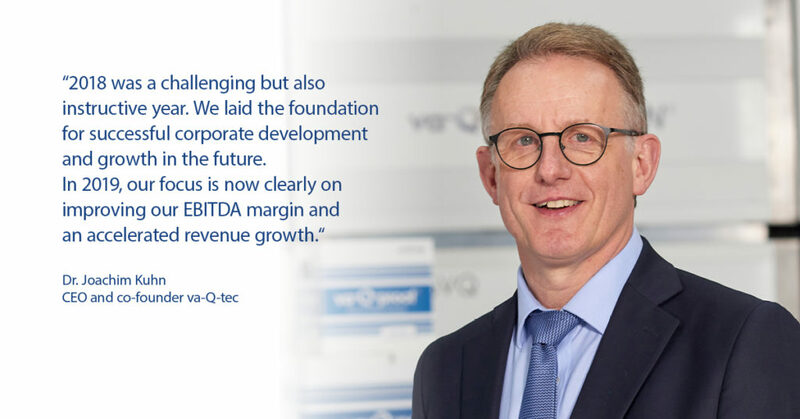 In 2019, our focus is now clearly on improving our EBITDA margin with dynamic revenue growth,” notes Dr. Joachim Kuhn, CEO and founder of va-Q-tec AG. After revenue had grown very strongly on average by 25% per year in the past five years and moderately by 8% in 2018, va-Q-tec expects medium to strong overall revenue growth for the 2019 financial year. Strong revenue growth is expected in the Services division, in particular. For the 2019 financial year, the company expects EBITDA to report strong year-on-year growth thanks to operating economies of scale and a growing share of revenues from the higher-margin Services business.